I haven't put much thought into decorating or furnishing the "nursery" (I use " " because our baby is still sleeping in our room, as per NHS guidelines). While other parents were busy painting their nurseries in Farrow & Ball's "Borrowed Light" and hammering floating shelves into the walls to display copies of "Where the Wild Things Are", I was too busy fretting about whether my baby would make it to term or not ... so, the nursery remained very much our "laundry" room where we hung clothes to dry (and still do) until a few weeks - and even months - after our baby was born. Then, we accommodated a chest of drawers that doubled up as a changing table ... and that was it. But slowly, over the past few months, we've added a few things to make it a little more nursery-like, in preparation for the day he finally moves into the room. 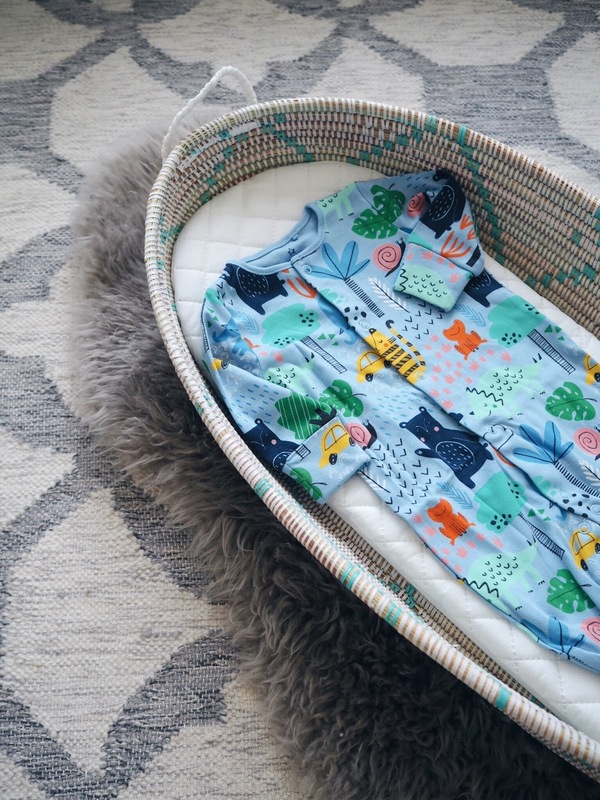 Night feed after night feed, I found myself going down the rabbit hole of Instagram accounts - bookmarking Scandi-inspired nursery decor and pastel-coloured cushions sold at eye-watering prices. On one of my early morning scroll-pasts, I stumbled on the beautiful prints from Munks + Me. The whimsical and imaginative (but not too "cutesy") prints caught my eye, and owner Kris kindly sent me three prints to add to our nursery wall (I especially love the rainbow and the lion!). Another welcome addition to the nursery was this gorgeous "Keur" changing basket from La Basketry, which is available in turquoise and yellow. Handwoven in Senegal by a group of female artisans, the beautiful basket comes with a comfy mattress (which my little boy helpfully had an accident on not too long ago ...!) and is made of two local materials: a local Senegalese grass and recycled plastic strips. It adds real warmth to our nursery and my little one loves wriggling in it while staring at the antique map we bought at a flea market in Bordeaux whenever I change him. Nookoo is a local business that sells homeware and children's clothes and accessories - I love their products. The mini cloud light sits on our changing table/chest of drawers and is helpful for evening changes, but we'll also use it as a nightlight when the baby moves into his own room. We also have this Flensted mobile from Nookoo - have you seen these beautiful paper mobiles? We bought one for my niece when she was born. The giraffes are a nod to John's trip to Kenya last year - a place we hope to visit with our baby one day (maybe when he's a bit older!). And finally, I'm wild about this Great Little Trading Company toy box I bought in their sale a few months ago. I use it to tidy his toys away at the end of the day, but it's so well-made and sturdy - it also looks great. Although I can't imagine our little one moving into his own room right now, I know the day will come very soon ... the saying, "They grow up so fast!" is cliched, but oh-so-true. Sigh. Do you have any favorite destinations for nursery decor? Let me know! Posters courtesy of Munks + Me. Changing basket courtesy of La Basketry. Light and mobile courtesy of Nookoo. All opinions are my own.